Practo is a healthcare start-up, owned and operated by Practo Technologies Private Limited, which offers patients and doctors a unique platform to interact. It enables patients to search for doctors and book appointments and offers a practice management tool to the doctors. With over 15 lac monthly users and a global presence, Practo has disrupted the healthcare segment by offering an efficient way for doctors and patients to connect. 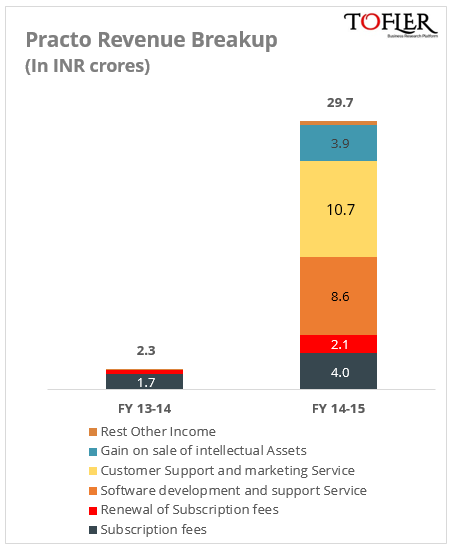 Practo reported a 13X jump in its revenue in FY 14-15. 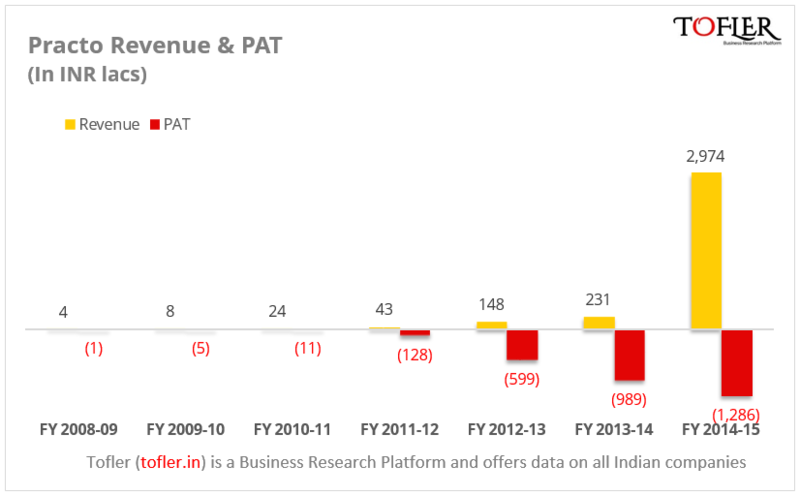 Revenue stood at INR 29.7 crores, against a loss of INR 12.9 crores, but there is more to it. Practo Ray is the main offering by Practo. It is a Practice Management tool for the doctors that provides them access to a SaaS tool, enables anytime access to data, e-prescription, reports, analytics and more. The company obtains its revenue from the subscription that it offers to the doctors. 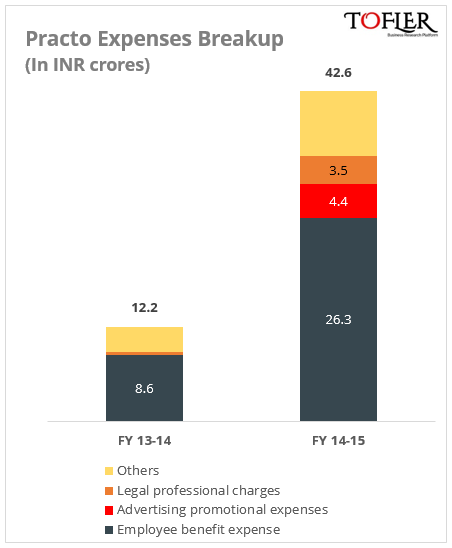 This revenue amounted to INR 6.1 crores in FY 14-15 (INR 2.2 crores in FY 13-14). In lieu of this understanding between Practo India and Practo Pte, the former will now be paying subscription charges to the latter. As mentioned in the notes to the financial statement, “On 27 August 2014, the Company has entered into an agreement with its Holding Company for the use of its Intellectual Property Rights (IPR) by paying subscription charges which is based on a percentage of revenue generated by the Company. However, the Holding Company has waived the subscription charges for the period from 27 August 2015 till March 2015”. Here, Practo India is being referred to as ‘The Company’ and Practo Pte is being referred to as ‘Holding Company and there seems to be a typo in the last sentence where August 2014 is written as August 2015. Back in 2008 when Shashank ND and Abhinav Lal founded Practo, they started its operations in Bengaluru. Over a span of 7 years, Practo has entered 15 countries across the globe. Recently it started operations in Kula Lumpur in October last year. The company claims to have more than 1.3 lac doctors on its platforms and more than 4 million monthly searches. They went on an acquisition spree this year, making four acquisitions in a span of five months – Fitho Wellness (fitness and preventive healthcare), Genii (a tech products development firm), Insta Health (hospital information management solution provider) and Qikwell (doctor appointment booking platform). The company has raised a total funding of INR 298 crores so far. Out of this, about INR 11 crores came from Sequoia Capital during March 2011 to October 2012. 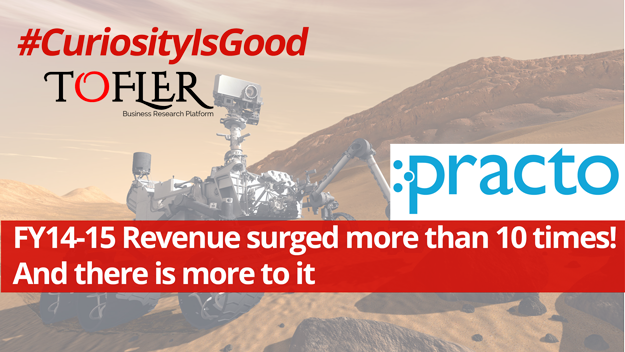 Rest of the amount – INR 286.4 crores – has been routed through their holding company Practo Pte. Last fund of INR 164 crores was infused in September 2015. In a crowded space of healthcare platforms, where a few like HelpingDoc have shut down and others like Fitho and Quikwell have gotten acquired, Practo competes closely with Lybrate. So far, it seems to be emerging as a clear leader in this space. In a latest bid, it partnered with Uber, to enable patients to book a cab through Practo app. Recently, it has also entered the beauty and wellness segment by bringing spas, salons and fitness centres on its platform.